Published on 13. 04. 2014 in comics and cartooning, hype & linkage and pictorial arts. Closed Tags: Didier Rykner, Jean-Luc Martinez. Louvre, Kiril Penušliski, Paolo Veronese, Pharoahe Monche, Raphael. Titian, Sean Michael Robinson, T. J. Clark. OK, I’ll try again. As should be evident, I’m not finding much time to blog these days, but I refuse to let go entirely, and who knows if times might not turn more propitious, Bunker-wise in the not-too-far future? Also, the National Gallery internet presence, which I’ve previously hinted at, is still in the works. So, not much to say right now, but I have some links to share! In-depth interview with Jean-Luc Martinez, the recently appointed director of the Louvre. Excellent, critical interview in which the director at Tribune de l’art takes his time to answer Didier Rykner’s not always easy questions. In three parts: one, two, three. Pharoahe Monche interviewed. Another in-depth interview, this one with one of the greatest rap lyricists. Candid and insightful. 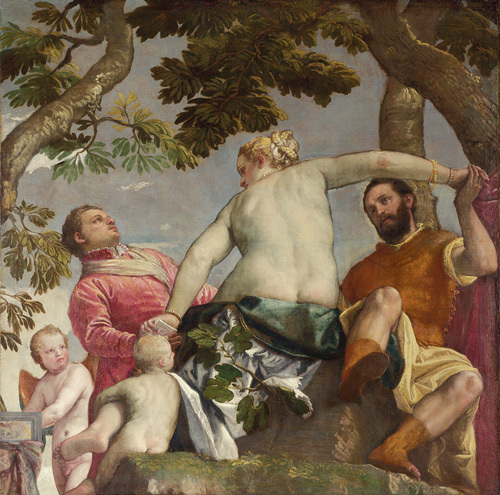 T.J. Clark on Veronese’s Allegories of Love at the National Galleries. Clark takes a close look at four wonderful pictures that just happen to be on display in one of the great exhibitions of the decade right where I work. Clark does tend to go on a little long, but it is still highly worthwhile to follow his eye. How Not to Make a Graphic Novel. Fine piece by Sean Michael Robinson on the creative process as it pertains to long-form comics.